It may surprise you to learn that the United States spends far more on health care, yet ranks much lower than other developed nations in many measures of health. Unfortunately, women’s health care is one area in which this is the case. The purpose of Our Moment of Truth™ is to improve women’s health and maternity care in the United States by re-introducing midwives and midwifery care as important options that should be the norm for women’s health care services. The time is now for women everywhere—including you—to understand how midwives partner with women to improve their health throughout life. Midwives’ skills and expert knowledge of women’s health care are often overlooked. Many people don’t realize how highly educated today’s midwives are, or they think that midwives are only knowledgeable about childbearing. But providing care and guidance through pregnancy and childbirth is just part of the range of services offered by midwives. Many midwives provide care for women of all ages—from teenage years through menopause and beyond. In fact, many women visit a midwife for women’s health needs before, during, and after pregnancy. This is one of the unknown truths about midwifery that Our Moment of Truth is designed to reveal. Rather than telling you how you should maintain your health or who you should be working with, Our Moment of Truth™ encourages you to become aware of your health care options and make informed decisions based on what’s best for your own needs and preferences. Our Moment of Truth offers education and options so that you can seek the best type of care and provider for your needs and improve your well-being through campaign information and resources. By participating in the Our Moment of Truth campaign, you can help increase understanding of women’s health care needs and the types of services that should be available to meet them. Let’s work together to make change happen—learn more about easy ways to get involved and share Your Moment of Truth. The American College of Nurse-Midwives (ACNM)—one of the oldest women's health care organizations in the United States—is the national organization that represents certified nurse-midwives and certified midwives in the United States. ACNM has embarked on an ambitious plan to help the United States refocus on and improve women’s health care services and, as a result, women’s health. With Our Moment of Truth, ACNM aims to redefine how women understand the health care options available to them. Learn more about ACNM by visiting www.midwife.org. 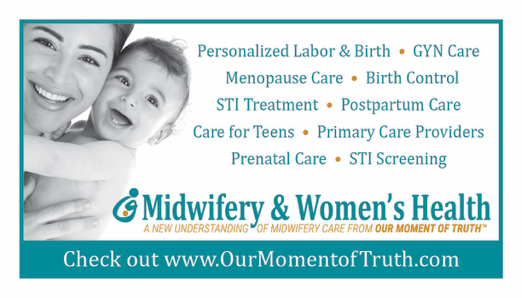 Visit www.ourmomentoftruth.com to learn more about how the high-quality care of a midwife can address women’s needs. Got questions? Ask the midwife! Is spotting during pregnancy normal? How does the NuvaRing work? Is using nitrous oxide for pain relief during labor safe? See the answers to these questions and more on our new interactive Ask The Midwife section of http://ourmomentoftruth.com/ask-a-midwife/. Don’t see what you’re looking for? Ask The Midwife a question of your own! If you are a member of the Kansas Affiliate of the American College of Nurse-Midwives. Please go to the Members section above to log in. Want to join the American College of Nurse-Midwives Kansas Affiliate? Go to: http://midwife.org/Join-ACNM to join or the Membership section above. Help us give women more options in childbirth. Click on the Advocacy link above to see how you can help. Use this tool to post a tweet to the account configured in Twitter Configuration under Settings on the Admin Navigator. The username configured is KansasMidwives.